Address Sign with QR Code Information Block - - personalized with the QR code you specify, your address, and color you select. 16" x 11.75" arch shape address plaque. Made in USA. 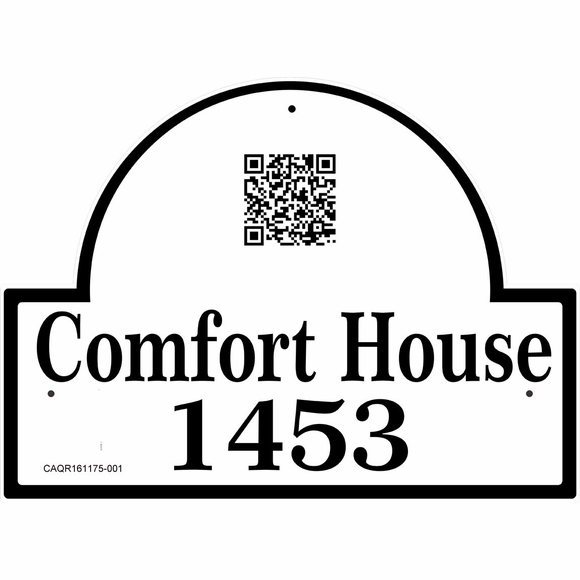 This very unique wall-mount address sign is made from sturdy and UV-stabilized laminated acrylic with engraved personalization and a scannable QR code. The engraved QR code image fits inside the arch and is the same color as the personalized address. For example, the QR code shown in the image was created from this entry in the QR Code input box: www.comforthouse.com. In this case the entry is converted to the URL www:comforthouse.com. This plaque contains two address lines in addition to the QR code. Holds up to nine (9) 2" characters or up to thirteen (13) smaller characters on each line. The more characters on a line, the smaller their size. Thin border is the same color as the personalization and accentuates the arch shape.